Bill O’Reilly and Fox News must think the American public is stupid. Just moments ago, O’Reilly had on a man named Tim Graham with the “Media Research Center” to talk about how he thinks the morning news programs are biased against Republican candidates, particularly Mitt Romney, because they cater to women, as if that’s a bad thing. Wow, so we can’t take Tim Graham’s so-called study about liberal bias in morning news programs seriously, but we can take his statements’ about morning news having a female audience being something that’s anti-GOP very seriously. It’s part of the overall GOP War on Women to fail to try and deliver a message that will resonate with women, then complain about shows women watch. Tim Graham and Bill O’Reilly should be ashamed for trying to cover up Graham’s GOP ties. 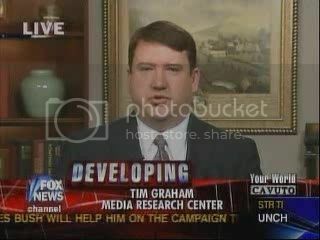 Be the first to comment on "Bill O’Reilly Has Female-Hating GOP Operative Tim Graham On Show"